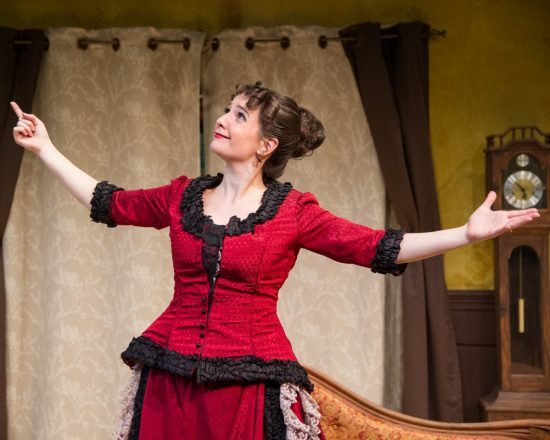 ‘My Fair Lady’ at Way Off Broadway Dinner Theatre. “…witty and smart…” -Dr. Mark Dreisonstok. 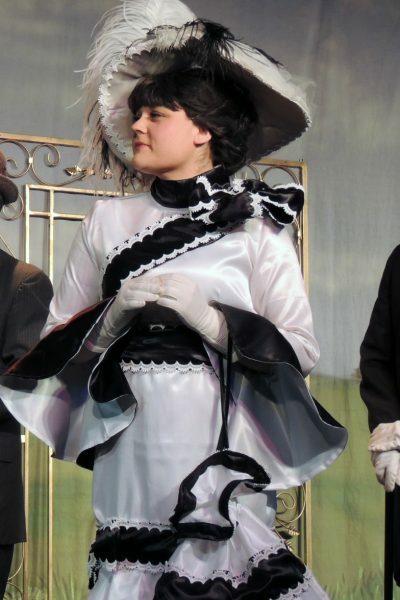 Megan E. West as Eliza Dolittle in “My Fair Lady” at Way Off Broadway Dinner Theatre. Photo courtesy of WOB. 2. ‘Resolving Hedda’ at Washington Stage Guild. “‘Resolving Hedda’ keeps the laughs coming and is a very funny romp among the upper crust.” – Mary Ann Johnson. Synopsis: Capping the season is another area premiere: Resolving Hedda by Jon Klein is a “boisterously funny” (LA Times) modern reimagining of Ibsen’s notorious schemer. It’s not easy being one of the most influential characters in a modern drama, especially knowing you have to die at the end of every performance. What would happen if you simply refused to play along? And what would the other characters do? Kelly Karcher as Hedda in Resolving Hedda by Jon Klein. 3. ‘Bus Stop’ at Aldersgate Church Community Center. 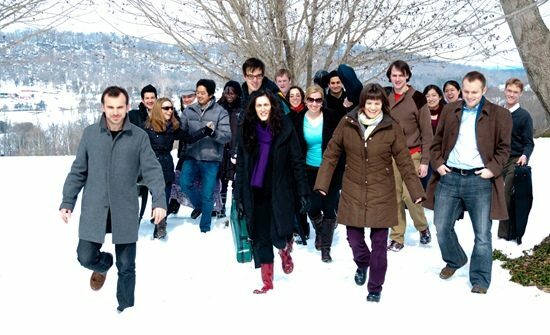 “This is a solid cast doing solid work.” – Mary Ann Johnson. Synopsis: In the middle of a howling snowstorm, a bus out of Kansas City pulls up at a cheerful roadside diner. All roads are blocked, and four or five weary travelers are going to have to hole up until morning. Cherie, a nightclub chanteuse in a sparkling gown and a seedy fur-trimmed jacket, is the passenger with most to worry about. She’s been pursued, made love to and finally kidnapped by a twenty-one-year-old cowboy with a ranch of his own and the romantic methods of an unusually headstrong bull. The belligerent cowhand is right behind her, ready to sling her over his shoulder and carry her, alive and kicking, all the way to Montana. Even as she’s ducking out from under his clumsy but confident embraces, and screeching at him fiercely to shut him up, she pauses to furrow her forehead and muse, “Somehow deep inside of me I got a funny feeling I’m gonna end up in Montana ” As a counterpoint to the main romance, the proprietor of the cafe and the bus driver at last find time to develop a friendship of their own; a middle-age scholar comes to terms with himself; and a young girl who works in the cafe also gets her first taste of romance. 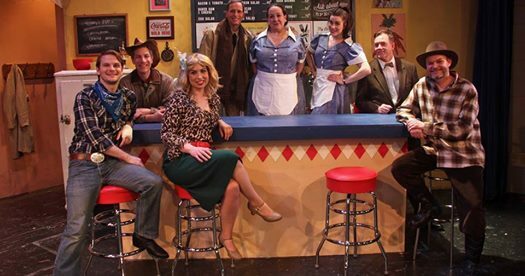 From l-r, John Paul Odle, Joel Durgavich, Emily Golden, Richard Isaacs, Elizabeth Replogle, Madeline Byrd, Thomas Salmon and Andrew Cannady in ‘Bus Stop’ at Aldersgate Church Community Theatre. Photo by Howard Soroos. 4. ‘Dead Dog’s Bone: A Birthday Play’ at Nu Sass Productions. 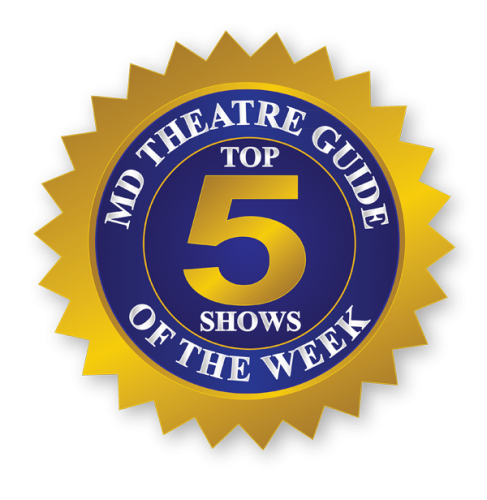 “This is a small gem of a show that begs to be savored.” – Mary Ann Johnson. Synopsis: Equal parts irreverent, funny, and heartbreaking, Dead Dog’s Bone is a family drama about loving people you have nothing in common with, the melancholia of birthdays, and the goodness of dogs. 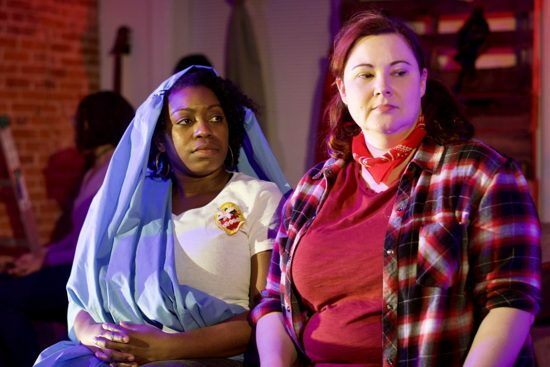 Danielle Hutchinson (The Virgin Mary) and Karen Lange (Dog) in ‘Dead Dog’s Bone: A Birthday Play.’ Photo by Mara Sherman. 5. ‘Queen of Basel’ at Studio Theatre. “…’Miss Julie,’ an exploration of class and gender. ‘Queen of Basel’ by Hilary Bettis and directed by José Zayas takes this piece of literature and catapults it into the modern world.” –Elle Marie Sullivan. Synopsis: It’s Art Basel, Miami’s weeklong party for the rich and famous, where real estate heiress Julie reigns over the blowout her mogul father is throwing at his South Beach hotel. But after tangling with her father and a run-in with a tray of cocktails, Julie plots her next move in the hotel’s barely used storage kitchen. Her companions are Christine, a cocktail waitress who recently fled violence in Venezuela, and Christine’s fiancé John, an Uber driver with ambitions. 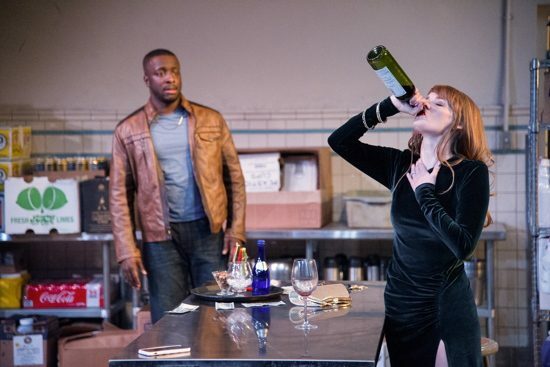 This explosive elixir of power, class, and race within the Latinx community is a bold and contemporary take on Strindberg’s Miss Julie by vibrant rising voice Hilary Bettis (TV’s The Americans). Andy Lucien (John) and Christy Escobar (Julie) in ‘Queen of Basel.’ Photo by C. Stanley Photography.